Since the 1st January 2003, all equidae must have identification, even if they stay in their field. This identification has to be carried out by a veterinary surgeon approved by the National Stud farms which will write out a card giving the details and description of the animal. 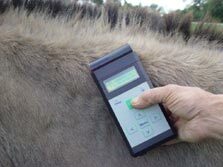 However, for the donkey's breed, the identification also requires the installation of a transponder in the left muscle of the donkey's neck. A transponder is a tiny microchip containing single code-bars. 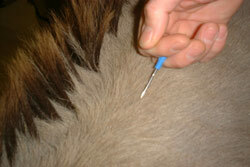 This very fast operation (a few seconds), and completely painless will allow you to identify your donkey. 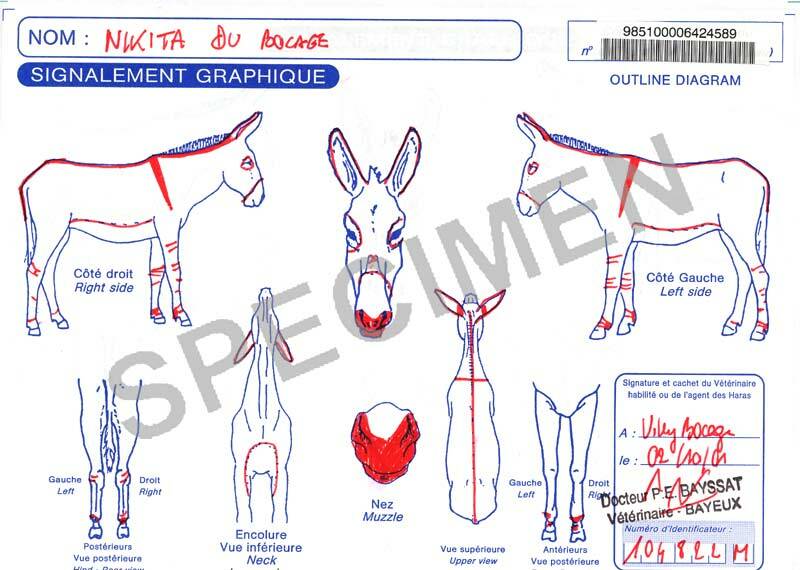 You have to know only the Cotentin donkey born from recognized father and mother "Cotentin donkey" can obtain an identification card with the appelation "Cotentin donkey book B" to the birth. The legislation oblige that the foal has been identified under the mother before it is six months old, and at the latest 31st December of the year of its birth. The veterinary surgeon will give you a provisional certificate of the "foal's description" and you will receive an origin card with four parts accompanied by a medicinal sheet. The donkey's purchasers will have to detach the first page and send it to SIRE under about a week, to change the name of the owner and send with it a honour's declaration property. You can get this document from the National Stud farms.